When I was a kid I LOVED to go to Piccadilly. Yes, the cafeteria style, meat and three, get your own drink restaurant. Specifically the Salisbury steak did it for me; brown gravy on top of the cubed steak with mashed potatoes and green beans was one of my favorite meals. Fast forward 20 some odd years later and here we are. 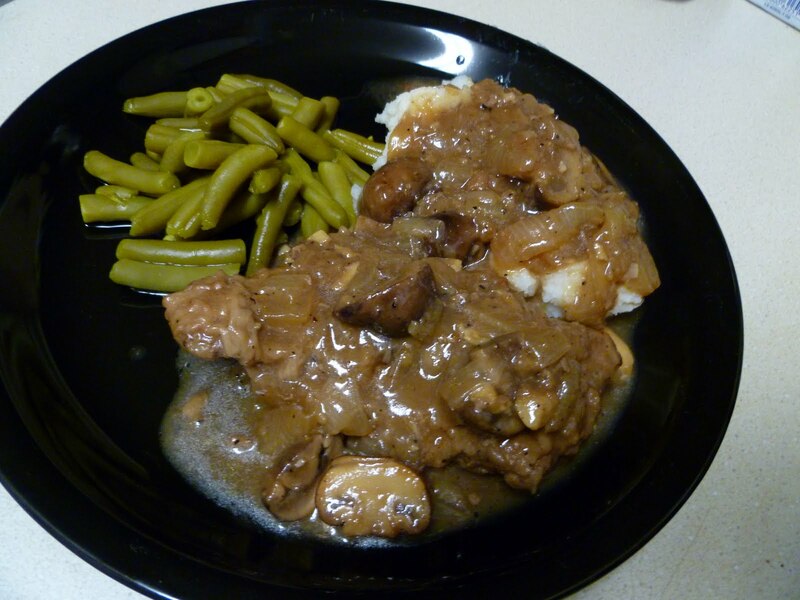 Last night I made Salisbury steak a little more grown up with cremini mushrooms in the gravy, but still served with the classics: mashed potatoes and green beans! The cooking time is a bit lengthy, an hour and thirty minutes in the oven, but it is hands off cooking time so you can “make this” while you are catching up on your DVR or cleaning your bathroom, and then when the timer goes off you have a hot, delicious, comforting meal all ready for you! Cover the bottom of a dutch oven with oil and heat over medium-high. Preheat oven to 300 degrees. Mix the flour and steak seasoning together in a casserole dish or pie pan (the high sides keep flour from flying everywhere). Coat the steaks in the flour mixture and shake off the excess. When the oil just begins to ripple add the steaks and sear on both sides about 2 minutes; you aren’t cooking them all the way through just browning them a little. Remove the steaks to a plate and add the onions and mushrooms to the dutch oven with the butter. Cook about 4 or 5 minutes until the onions just start to become translucent. 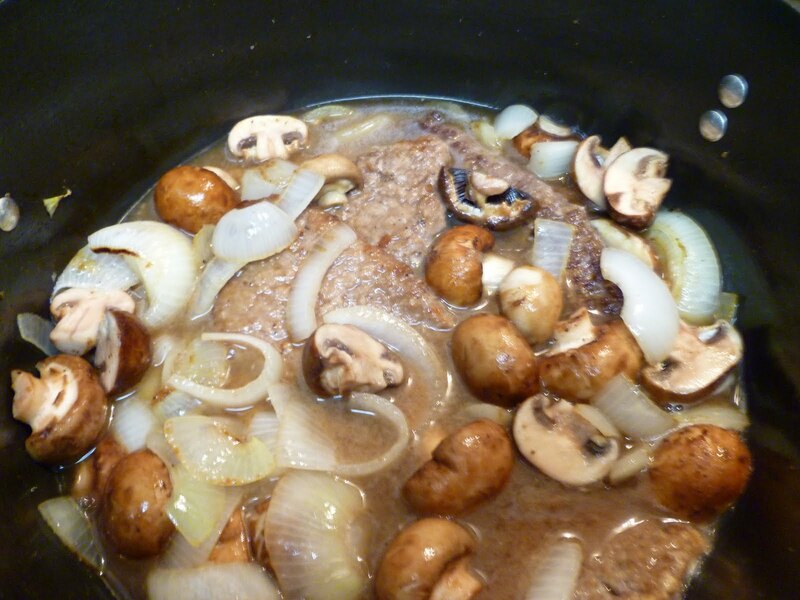 Add the stock and garlic to the pan, season with a little salt and pepper and nestle the steaks into the mixture. You want to make sure the steaks are emerged in the liquid. Put the top on and pop it in the oven for an hour and a half. Do not open, leave that liquid trapped in there! When time is up remove from the oven and check the sauce that has formed, if it is the thickness you like you are done. 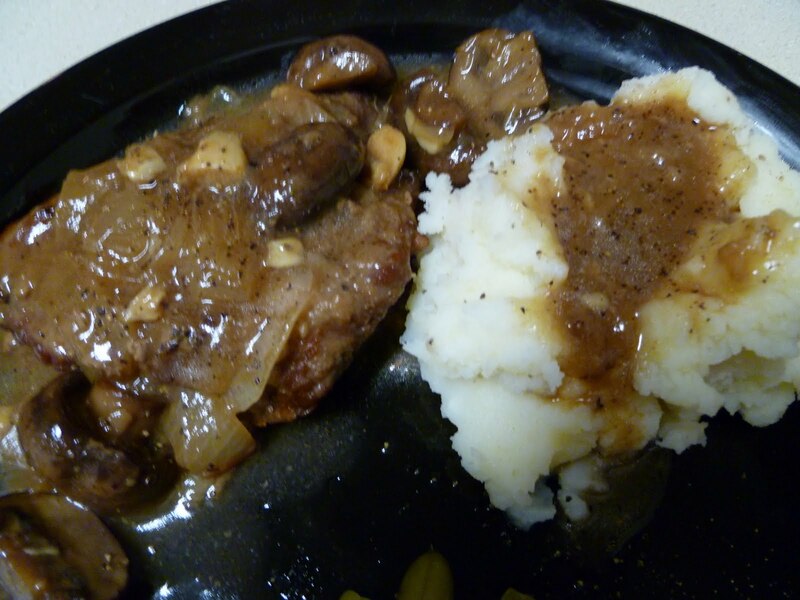 If you prefer a little thicker gravy, remove the steaks and cover with foil then heat the gravy over medium-high stirring regularly until it is your desired consistency. Serve with mashed potatoes and green beans, the perfect balance! This sounds great! I haven't had Salisbury Steaks in forever! Yumm... I think I will cook this for Wes tonight. Looks Delish! My New Love: Zucchini Fritters! Give it a try: Tomato Pie!